Club sheets and garment photos have been posted but I thought I might give a more conversational overview-for more detail, you can go to the original sheets (click on Club Sheets heading above). but cowls can be finicky. She didn’t like the look and I remembered a Threads article on making a cowl from a regular neckline-you just make slits from the neck toward center bust and open the slits. 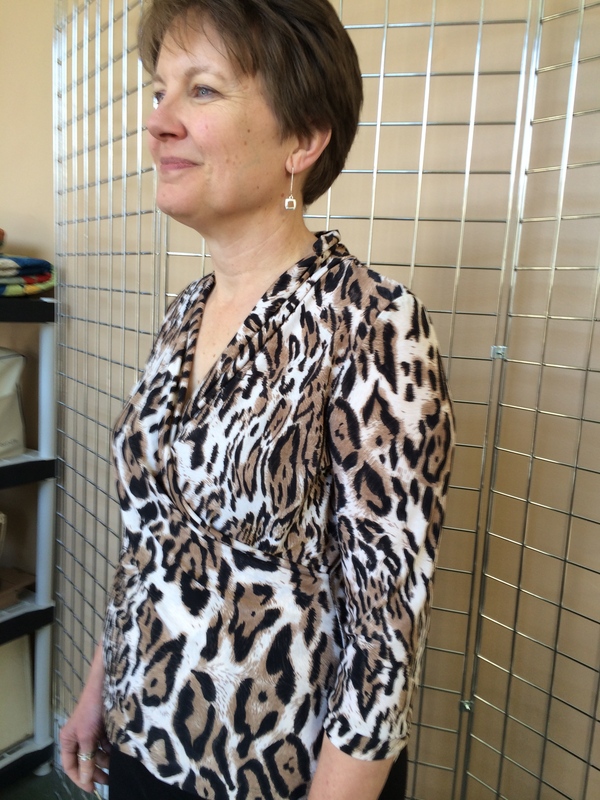 I suggested she just sew the “slits” together as pleats-kind of like Katherine Tilton’s new blouse (Butterick 6026). Debbie used New Look 0180 as a guide. The dress looks great-as Debbie said, “Lemons to lemonade”. Fabric is from Treadle Yard Goods. My favorite this month was a combination of MCCalls 6884 and 6513. 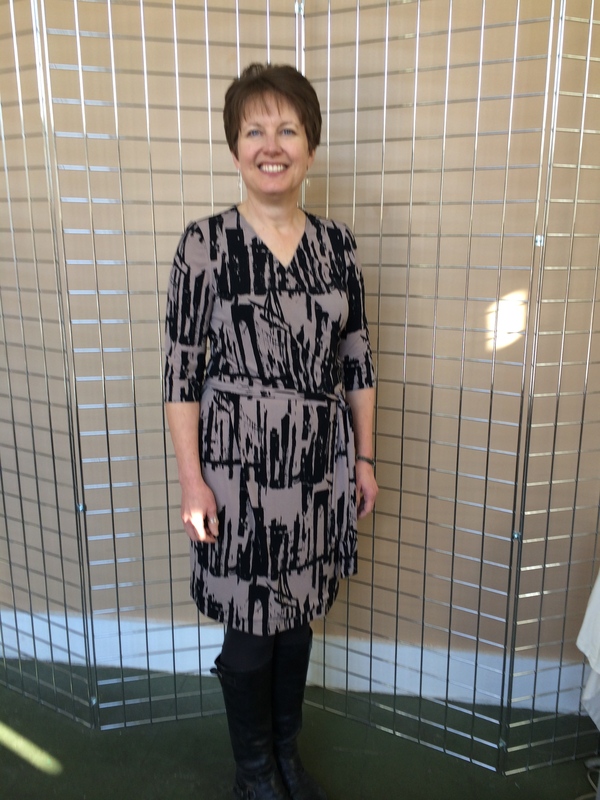 I started with the wrap dress (6884) and eliminated the vertical hem on the outer skirt by sewing it into the seam. Another essential change is to serge 1/4″ elastic in the the narrow hem on neck edge. This holds the neckline together and feels very secure. I wanted a little more “noise” around my face so I compared McCalls 6513 to the dress pattern. The armhole was lower in 6513 and I really liked the fit of 6884 so I just copied the shirred neck and facing (all one piece) from 6513 and added it to 6884. Worked pretty much like a charm. The other great part about this wrap is that nothing shows when you bend forward! I also had to give Burda 6990 a try. 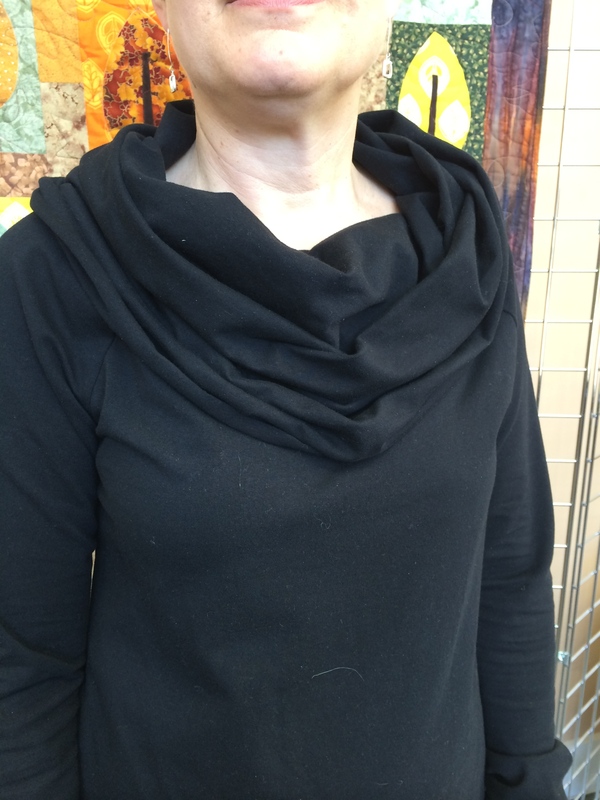 Debbie made the funnel neck last month and I tried the big cowl-View E. It meant finding a 3 yd. piece of fabric in my stash but it was worth it! The fabric is a soft cotton knit and the cowl is big enough to stretch over my shoulders (like I see in the magazines :)) The cowl is sewn to a broad boat neck so no low neckline. Check out more info on the Club Sheets or contact us if you have questions. And thanks to all of you that attended and brought show and tell. Sew inspirational!! Posted on February 21, 2014 by KristinPosted in Fashion Sewing Club, Pattern review, Patterns, UncategorizedTagged Burda 6990, Butterick 6026, Katherine Tilton, Kwiksew 4026, McCalls 6513, McCalls 6884, New Look 6184.